URBAN DECAY 'Rebound' Customizable Palette - Give Me Gorgeous! 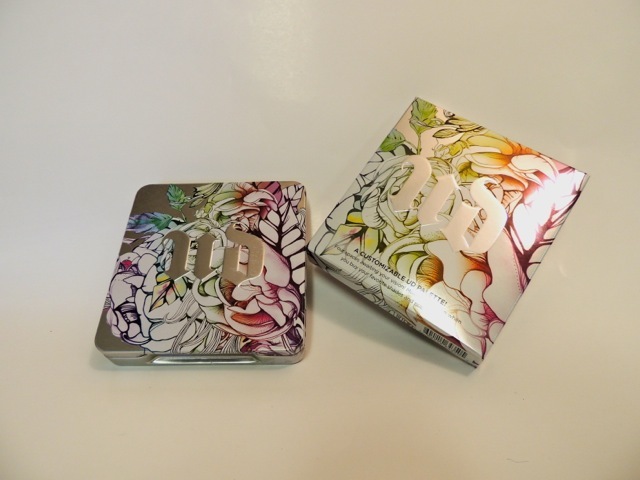 The botanical design on this metallic Urban Decay four-eyeshadow customizable palette is gorgeous! The four-eyeshadow palettes are the perfect size for toting and handling. It comes empty, ready to hold four Urban Decay eyeshadows of your choice. I know! I already have several of these, but I could not resist getting this one because of its beautiful design. Also, one can never have too many UD eyeshadows – with their massive selection of colors to choose from. With this purchase, I bought the color Last Call (a metallic sugar plum) that was a favorite of mine for one of the pre-set palettes I have. Now I’m planning which other colors to get to finish filling this one. It also says that its distributed via Newport Beach, CA. The customizable palette sounds like such an amazing idea–what would you say would be four good eyeshadows for someone getting one for the first time? I liked the Taylor Swift-inspired style shots on your blog! And I’ll have to try the Blinc mascara that you mention is a staple in your beauty routine. I find that its always handy to have eyeshadow shades for each of these purposes: A. Highlighter, B. Lid, C. Crease and D. Definition – eyeliner/smoky eye. I hope those suggestions are helpful. Thanks for your visit!